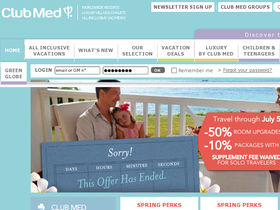 Club Med, online at ClubMed.US, is your destination for booking all-inclusive vacations. Club Med offers vacation deals at resorts worldwide for all members of the family as well as romantic getaways for couples. Club Med also has vacation packages for resorts geared toward sports, golf, winter sports, tennis, scuba diving, and well-being. Club Med specializes in packages for children and teenagers as well as luxury packages at destinations around the world including: the Bahamas, Mexico, Florida, Australia, Brazil, Tunisia, and the Caribbean. RetailSteal.com has the best Club Med coupon codes, Club Med discounts, Club Med coupons, and Club Med promo codes. Shipping and handling rates do not apply to Club Med. See website for details. Check out the vacation deals at Club Med and save up to 50% on travel worldwide. Click link to get started today. With advance booking, get 15% off your vacation when you book online at Club Med. Click to save. Kids stay free when booking online at Club Med. Click link to book. Couples receive 50% off the second guest when they book their stay online at Club Med. Click link to book. At Club Med, book August last minute deals from $129 a night. Click link to book now. Head over to Club Med North America and purchase a 7-night all inclusive family escape for four people for only $749 per person. Hurry over to Club Med North and book your vacation 3 months in advance to save 15% on your purchase. Save 10% on your Best Western purchase with this coupon code!